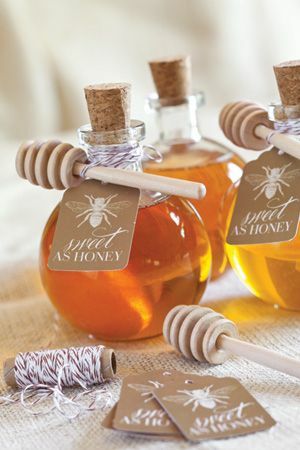 What better way to say thank you to your guests than a meaningful and practical #wedding favor they’ll love? This age-old tradition has evolved greatly over the years, with the current trend leaning towards personal and creative gifts that are fun and useful. If your budget is tight, don’t worry – something simple and handmade can be just as effective. A great idea is to link the favors to your wedding decor. Gifts could tie into the style of the invitations, menus or table decorations, or even be a part of the table decorations and overall theme of the reception. An inexpensive custom labels, hang tags or personalized ribbon on almost anything will add a personalized touch and tie it into your theme.